RING HOLDER LEAD CRYSTAL LEAF SHAPED TRINKET DISH 4 1/2" x 2 1/2"
CRYSTAL RING DISH, LEAF SHAPED. GENTLY USED, VERY GOOD CONDITION. Up for your consideration is a two piece hand cut 24% Lead Crystal hurricane candle holder made in Poland. Any information you have on an item and are willing to share is greatly appreciated. We will be reasonable with you. YOU WILL NOT BE DISAPPOINTED IN THIS 7-3/4" TALL VASE. EXCELLENT CONDITION ALL THE WAY. Lead Crystal Jar- No Lid. Condition is Used. No chips or cracks. Shipped with USPS First Class Package. 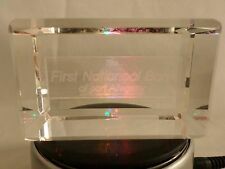 Neiman Marcus 24% Lead Crystal Oval Tray. Made in West Germany. 10" long by 5 1/4" wide (at widest point) by 3/4" tall. Overall very good condition - no chip or cracks. 2 Champagne Flute Glass Cut Lead Crystal Glass Miller Rogaska Richmond. No gold trim around the edge. Perfect condition. Shipped with USPS Priority Mail. 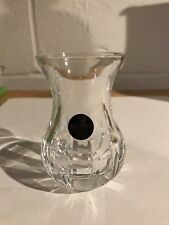 Sweet Little Poland Made Bud Vase. Is perfect size to capture that Single bud given by your lover or a bunch of wildflowers given by a precious child. Very heavy over 24% lead Crystal made in Poland. CASA LORREN ITALIAN DESIGN YELLOW ROSE SCULPTURE. >Material: 100% Lead Crystal. >Crystal RoseColor : Sunny Yellow. >Original Silk Padded Paper Box with clear plastic top. > Leaves Color: Green. Gorgeous lead crystal tree with long top branch - signed Marcolin Sweden with numbers on bottom - also has Marcolin Lead Crystal SWEDEN sticker on it. Six lead crystal coasters in excellent condition. From Cold War era West Germany. Handmade Romanian 24% lead cristal piece in good condition. One small flake on the inside of one tooth near the paper label (see last photo). Pinwheel star design. 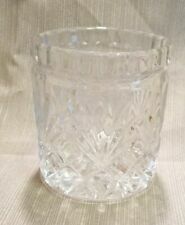 HEAVY LEAD CRYSTAL LARGE COVERED LID BISCUIT BARREL JAR GALWAY IRELAND 8.5" TALL TO TIP OF LID ABOUT 6" TALL TO THE LID. IT HAS A RIM CHIP THERE IS A PICTURE. IT WEIGHS 3 LBS, THIS IS NOT THE WEIGHT OF THE PIECE. Lot of 3 Lead Crystal Small Bud Vases. Good condition. One has small chip on rim. #2 4 3/4" tall by 1" wide. Center has cut daisy flower pattern Diamond Block pattern at top and bottom. Hofbauer Collection Lead Crystal Dealer Sign. Excellent preowned condition. May have some wear and has a small imperfection which is photographed and circled. Roughly 4.25”. See photos for wear and measurements. Shipped with USPS Priority Mail. Sugar ~ 5 ½” from handle to handle x 2 ¾” tall. If this should occur, it is. Read below for INTERNATIONAL SALES. The Byrdes Collection featured birds etched and pressed into the glass. The line included dozens of pieces in a variety of shapes and sizes, Most pieces can be found either clear or with ruby red flashing surrounding the birds. Beautiful hand crafted full lead crystal glass slipper by Godinger from his Crystal Legends line. 7" long, 3 1/8" tall. be sure to use the Zoom feature to study photos. You will receive the item(s) as shown in the photos. 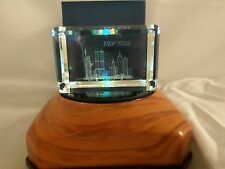 ZAJECAR made in Yugoslavia crystal vase and ring holder, vase is approx. Vintage 24% Zajecar Lead Crystal Miniature Bud Vase. Condition is Used. Shipped with USPS Priority Mail. This little vase was made in Yugoslavia around the 1970s. It’s in perfect shape, no chips cracks or imperfections! Weighs 3 ounces each. Holds 2 oz. It was crafted in Yugoslavia. You can also use use it as a small bud vase. Or just dining room or vanity decor ! STEPHENS PORTUGAL FULL LEAD CRYSTAL! HARD TO FIND - RARE - NO LONGER BEING MADE. Lead Crystal Handled Basket Ball Shaped with Pinwheel Design. The piece is 5" tall, 5 1/2" wide, and 3" base heavy and made very sturdy. Another fantastic piece by Vannes. Full Lead Crystal Hand Made in Ireland Cut Glass Port Decanter with Stopper and Glass. Decanter Height: 6 in. Glass Height: 4 in. lead crystal brides basket. From Hofbauer's 'Byrds' Collection. Excellent. Lead crystal brides basket. From Hofbauer's 'Byrds' Collection. Reed & Barton Miller Rogaska Lead Crystal Alfresco Clear Goblet Measures: 7 3/8 inches tall Condition is New. THIS IS A BEAUTY 10" X10"X 8" SUARE LEAD CRYSTAL CAKE STAND. IT IS IN EXCELLENT CONDITION THERE IS A WELL IN THE CENTER. IT WEIGHTS ALMOST 8 LBS. BEAUTIFUL LARGE HEAVY 24% LEAD CRYSTAL BOWL. 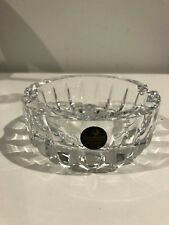 This is a beautiful CRYSTAL BOWL 24% LEAD CRYSTAL BOWL. VERY HEAVY ALMOST 6 lbs. 4 1/2" tall and 9" wide at top and 6"wide at bottom. Many differnt cuts and swirls in the design. Good shape except for a chip on the bottom. Very elegantBohemia 24% Lead Crystal Bud Vase. 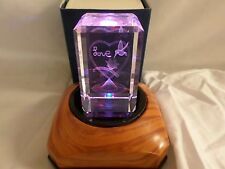 Clear cut glass on a pedestal base. This is for a Hofbauer Byrds Ruby Red lead Crystal Dish With Cover. Very good condition no chips or cracks. This does show some signs of wear on the ruby part on the lid. Please see pictures. (You are looking at Godinger's made for Neiman Marcus Vase and Wine Coaster (I always thought it was a candy dish and did use as such :) ).